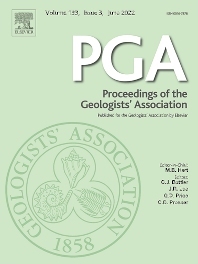 The Proceedings of the Geologists' Association is an international geoscience journal that was founded in 1859 and publishes research and review papers on all aspects of Earth Science. In particular, papers will focus on the geology of northwestern Europe and the Mediterranean, including both the onshore and offshore record. Following a long tradition, the PGA will focus on: i) a range of article types (see below) on topics of wide relevance to Earth Sciences ii) papers on aspects of Earth Science that have societal relevance including geoconservation and Earth management, iii) papers on palaeoenvironments and palaeontology of the Mesozoic and Cenozoic, iv) papers on aspects of Quaternary geology and climate change, and v) papers on the history of geology with particular reference to individuals that have shaped the subject. These topics will also steer the content of the themes of the Special Issues that are published in the PGA. Papers published in the PGA will take the form of Research papers and Review papers. In addition it will publish Viewpoints, which are aimed to provide authoritative views from Earth Scientists on topics of debate within our subject, Topical or Teaching Perspectives on subjects of current, or potentially future importance and are not necessarily research papers but are written in a manner that makes them particularly accessible to the general public and students, and Contexts, which are short papers giving the wider scientific context of a paper that is published in the same issue. Submissions of all these types of papers, within the scope and aims of the journal, are welcome. Rapid Communications are no longer appropriate as all papers are published rapidly, being available on Science Direct with a doi, as soon as the proof has been corrected.